Bob Dylan typically is at his best whenever he moves at a rapid pace. While he may spend time pondering over his lyrics, he prefers to take a guerilla-based approach to the recording of his albums. Over the years, he rather infamously has thrust his new songs in front of makeshift bands, putting the musicians on the spot and demanding that they make sense of whatever he has written. Where many artists might have come away from these sessions with little-to-no useful material, the results that Dylan has elicited routinely have been spectacular. By contrast, whenever a producer forces him to slow down, he tends to falter by giving birth to a batch of material that feels forced into a particular framework. For Dylan, spontaneity is king because only then is he able to trust that his instincts will lead him to the buried treasure. Life, however, has a funny way of making sure that everything breaks even. Where his previous outings — as well as his monumental endeavors from the 1960s — benefited from the immediacy of his approach, Dylan’s latest foray Together through Life largely feels as if he is wildly racing toward the finish line with reckless abandon. All things considered — and, of course, Dylan being Dylan — the album still delivers a solidly satisfying romp through the blues-based constructs that have dominated his recent endeavors. Nevertheless, it’s equally true that Together through Life isn’t nearly as strong as Time Out of Mind, Modern Times, or even Tell Tale Signs, the odds-and-sods eighth installment of his archival series. In recent years, Dylan has turned almost exclusively to his touring band for support in the studio. Having to keep pace with him night after night on the road, the musicians were completely in synch with what he wanted to accomplish with his work. When brought face to face with his new songs, they already were predisposed to the ideas Dylan was trying to convey. In effect, the established chemistry that Dylan had with his ensemble made it much easier for the instrumentalists to fulfill his vision without much planning or thought. For whatever reason, in making Together through Life, Dylan opted to depart from his normal routine. In addition to his longstanding bass player Tony Garnier as well as multi-instrumentalist Donny Herron and drummer George Recile — both of whom are relative newcomers to his outfit — Dylan enlisted the help of Heartbreaker Mike Campbell, Los Lobos’ David Hidalgo, and lyricist Robert Hunter. On paper, this union of like-minded souls should have born tremendous fruit, especially considering that the overriding concept for the endeavor seems to have been to merge the edgy blues of Love and Theft with the Tex-Mex flavors of Doug Sahm’s output. All of the guests whose services Dylan employed have long been sympathetic to his cause. In reality, though, Hidalgo, Campbell, and Hunter merely provide the kind of support that is unobtrusive and generic. Campbell and Hidalgo dot the landscape with an assortment of tangled guitars and splashes of accordion sounds. Without a doubt, their accompaniments are as well suited to the scorched-earth trails of Dylan’s dusty, border-town narratives (Beyond Here Lies Nothin’) as they are to his gritty urban landscapes (Jolene). At the same time, though, Campbell and Hidalgo either were daunted by the task that had been placed before them or were unwilling to allow their personalities to roam free. Whatever the reason may be, the end result is that they failed to lend any sort of distinctive flair to Together through Life. As for Hunter, his presence hardly is felt at all. 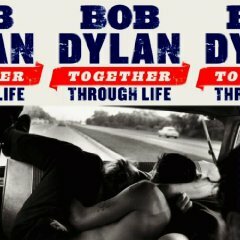 The lyrics to the material on Together through Life touch upon themes that have become familiar parts of Dylan’s recent forays, and Hunter’s input wasn’t really necessary to bring them to fruition. Oddly enough, Dylan’s previous outing Modern Times drove much closer to the heart of the Grateful Dead’s turf. The thing that elevates Together through Life, then, is Dylan himself. Just as he did on Modern Times, Dylan sings his material like only he can. With the passage of time and the inherent maturity that comes with it, he has found ways of wrenching a wealth of meaning from each word he utters. An old bluesman with a snarl and a sneer, Dylan can make a joke sound menacing, and he can inject a thread of optimism into heartache’s crushing sense of despair. Over the course of Together through Life, he repeatedly transforms even his most casual turns-of-phrase into things that reach farther and cut deeper than they appear to do on paper. It’s here where Dylan’s meditation on the carnal and spiritual aspects of life and love gains traction. Together through Life isn’t on the magnitude of Blood on the Tracks, of course. None of its tracks achieve the heights of any of Dylan’s other recent compositions, either. Regardless, as a whole, Together through Life not only manages to hold its own among the lesser nuggets from his back catalogue, but it also extends his string of epic, late-career works.